Degenerative arthritis, a "wear and tear" process that may be related to age, injury and genetic predisposition. 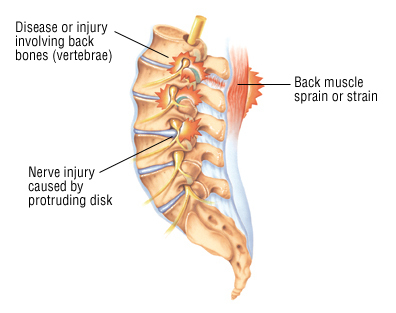 Back pain varies widely. Some symptoms (often called "red flag" symptoms) may suggest that the back pain has a more serious cause. These include fever, recent trauma, weight loss, a history of cancer and neurological symptoms, such as numbness, weakness or incontinence (involuntary loss of urine).